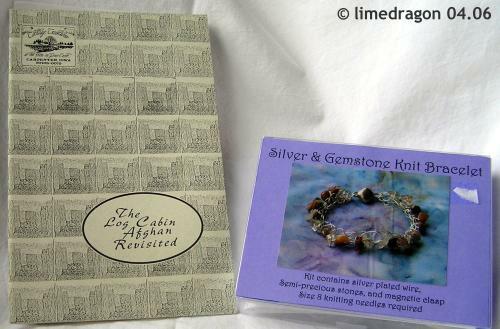 Mom surprised me by purchasing a My Bagatelle bracelet kit (to knit) for herself from Playing with Yarn! At the Cottage Creations booth, there were many samples on display. 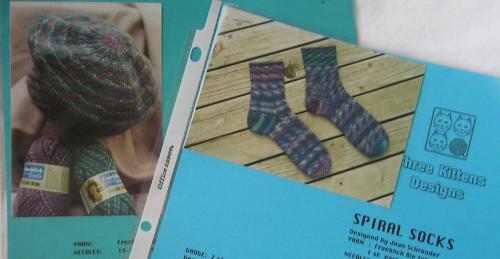 Mom particularly liked the Log Cabin afghans, so we got the pattern booklet. The booklet is really fun with accompayning hand-drawn illustrations. It also provides various color and layout ideas/suggestions, which I really liked. I bought a beautiful skein from Joslyn’s Fiber Farm, but can’t showcase it here right now. 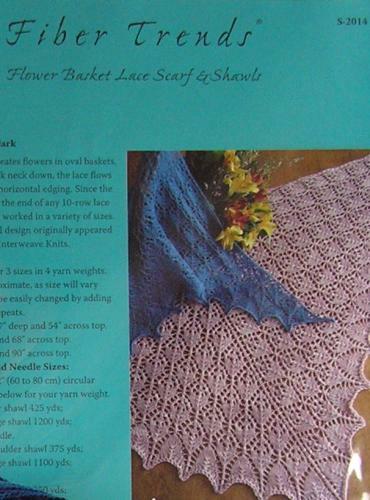 With my purchase, I was able to choose a free Fiber Trends shawl pattern, and I picked Flower Baskets Lace Scarf & Shawl. My last Yarnover Purchase was at the St. Peter Woolen Mill booth where I got some more Secret pal goodies and a sweet notecard set. No pictures or details of these until later on, sorry! There was a lot of fibery goodness… not just yarn, but some spinning supplies. One booth had fun mugs, bowls, and plates decorated with sheep, yarn, or spindles (”Functional Ceramics” by Jennie E Lanners). The Tall Tale had beautiful baskets in all sizes. I was also quite tempted by 2nd Time (recycled) Cotton, yum. I saw a Beka Yarn Swift at The Yarnery booth; it has a standing base rather than the usual clip stand. I didn’t get it, but I plan to keep it in mind (I couldn’t find any website or additional information about the Beka brand, though). But that’s not all! Yesterday, I happened to see a TV commercial that Hancock Fabrics was holding a 10%-75% clearance sale today only!! And Yarnover, which was at Arlington High School was just a few minutes away from the Larpenteur-Lexington Aves shopping center, we stopped there on the way home. Yep, the Lion Brand was on sale! 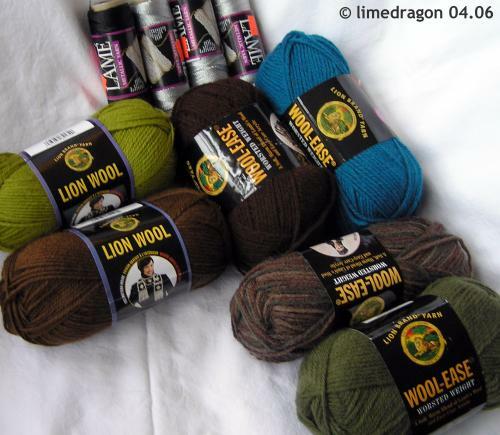 The Lam� was 50% off, the Peacock blue skein had a 30% discount, and the rest were reduced 10%. I was glad to get my hands on some Lion Wool so I can see how it knits (and maybe felts). You’ll see that I’ve grouped the Wool/Wool-Ease into groups of two… I bought these to practice some Fair-Isle hats or other projects. Yes, there is a lot of brown, and a lot of green. I considered a charcoal gray, but couldn’t find a contrasting color I liked.